We eat a lot of cheese. We live in a small dairy farming community and we eat a lot of cheese. In a disaster when we would be living totally out of our food storage cheese is one of the things we would miss the most. I have looked into and tried a couple of options to add cheese to our food storage. I have even made cheese from my non fat dry milk. (It was a lot of work and it did not turn out that great). Freeze Dried cheese is a great option. But honestly it is too expensive for me to store very much of ($38.00 for 44 servings is kind of pricy). So I started looking into powdered cheese. Have you ever tried powdered cheese? It is a pretty common food storage ingredient. 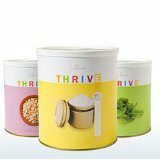 It is on most of the food storage lists I’ve seen, but I was hesitant to use it. When I first started thinking about doing this series about powdered cheese I Goggled recipes for powdered cheese, the search came up with a lot of discussion forum results and they were pretty much all in agreement. They all said something to the effect of “Powdered cheese is terrible!” But after trying powdered cheese I know that powdered cheese can be excellent. I have been surprised and pleased by how much I like powdered cheese. I have tried a couple of brands of powdered cheese and some of them are terrible. 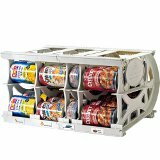 I know I always say it but buying quality food storage means you have quality food to eat. With powdered cheese this is especially true. Of the powdered cheeses I have tried I like the THRIVE Cheese Blend (it is not really a blend it is made from cheddar cheese) and the King Arthur Vermont Cheese Powder (which is currently unavailable sorry). Both have a clean cheddar flavor and both reconstitute to a smoothly in a cheese sauce. The thing I like most about them is they do not taste chemically, so many of the cheese powders I have tried are really fake chemically tasting. I really love savory breads. I serve this pull apart bread like I would bread sticks. My husband always wants me to add more butter to this which would be delicious and would probably kill him. 2) Place the dough in a lightly greased container — an 8-cup measure works well here — and allow the dough to rise for 60 to 90 minutes, until it's just about doubled in bulk. 4) Divide the dough into 32 pieces, by dividing in half, then in halves again, etc. Don't worry about making them exactly even; and don't bother to shape them into balls, unless you're totally into perfection. 5) Lightly grease a 9" deep casserole dish, or large bunt pan. Pour a generous layer of olive oil in the bottom of the pan, to coat. 6) Make the coating: whisk together the cheese powder, cornstarch, and Italian Seasoning. Put the melted butter in a small bowl. Dip each ball in the butter, then the coating, then place in the pan in a single layer; you'll need to squeeze them in. 7) Cover the pan, and allow the dough to rise till quite puffy, about 60 to 90 minutes. Towards the end of the rising time, preheat the oven to 350°F. 8) Uncover the pan. Bake the bread for 15 minutes. Tent with aluminum foil, and bake for an additional 20 minutes, until it's golden brown when you peek underneath the foil. An instant-read thermometer inserted into the middle of the center bun should register 190°F, or very close to it. 9) Remove the bread from the oven, and turn it out of the pan onto a rack. Serve warm. I did not develop this recipe but I have had it for a long time and can't figure out where I got it. I have adjusted it to fit our family. But I would love to give credit to whomever originally gave it to me. If it was you please let me know.